Terminal Station: Poncey-Highland Master Plan; I rant about "road diets"
Poncey-Highland Master Plan; I rant about "road diets"
The Poncey-Highland master plan was released last night. You can find the details here. Can I just say that I find "road diets" annoying? I know that there is a lot of traffic on North Avenue - I use it every day to go to and fro at Georgia State. The reason for the traffic is not because North Avenue is poorly designed north of the BeltLine, it is because North Avenue is a million feet wide SOUTH of the BeltLinePonce and because de Leon is a mess during rush hour. The real problem there is because there aren't enough east-west corridors other than Ponce de Leon. All the traffic bulbs, medians, and swervy lanes aren't going to change that - these are band aids. Hideous, Disney-character-covered, fall-off-in-the-shower band-aids to appease a neighborhood group. I hate traffic bulbs and lanes that swerve for no reason other than to mess with drivers. Yeah, yeah, that is the point, I get it. But they've already got on street parking in this plan, and North Avenue is not THAT wide! make the lanes a little narrower and widen the sidwalks or something. Some of these plans are just super annoying and I think you can slow traffic down enough with the other methods. I know some Tech planning students read this blog - please explain to me why North Avenue needs random sidewalk bulbs, random crosswalks, and lane changes, and why something more subtle (just narrower lanes and on-street parking) won't suffice. For example, just before Linwood the eastbound lane swerves left to accommodate a crosswalk midblock, before then heading straight into the left turn lane of the westbound lane at the intersection, forcing the driver into an awkward swerve back to the right to stay in the correct lane and not hit cars waiting to turn. Surely a little median would serve better here? WTF? I personally find many "road diets" and speed humps to be an all-thumbs approach to traffic calming, and every time I see them, I cringe. I'm not saying ALL road diets are awful, but I abhor the speed humps they installed a block from my house. The McLendon Ave stuff isn't awful once you get past the golf course, unless you are a biker. By the time any of this happens, hopefully I will be long gone from GSU and I won't have to be annoyed by this every day. If I am still driving to school when this North Ave stuff is built, I will probably end up shooting down Greenwood to cut over to Ponce Place and Ponce de Leon. Until everyone started complaining about Greenwood and they put some stupid speed humps there. The reason why North Ave needs a road diet is because someone like you went 'shooting up' North Ave hit (and nearly killed) one of our children. North Ave is a residential street only two lanes wide, but it is treated like a major speed way for people headed east and west. I highly recommend you do like I did when I went to GSU, ride MARTA or your bike to school. I hear ya, Atlanta Gal. My wife and I lived in the Poncey area for three years. We like to go car free on the evenings and weekends as much as possible but eventually found that crossing Ponce and North Ave was ridiculously dangerous for pedestrians even at cross walks. I saw so many people run red lights while I was trying to cross. After our son was born we moved to Midtown off of Peachtree and have found it to be a much safer pedestrian experience. They've made some great improvements is cross walks there. I don't know what the solution is for making Ponce and North Ave safer for pedestrians. 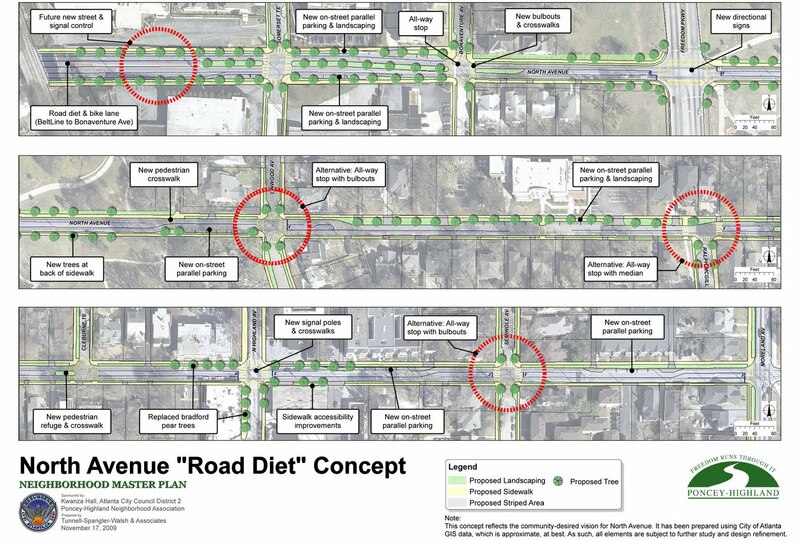 This Road Diet thing looks pretty wacky, but maybe it'll work. I've also considered that a Bus Rapid Transit line that connects the area with a MARTA station might get some wackos off the road. I'm a GT Planning student, and I happen to read your blog and really enjoy and agree with 95% of what you post. I also work as an urban planner, although not in transportation. I will do my best to explain some of your issues, at least as I see it. First, the odd lane angle changes appear to be due to the linear right-of-way lines and an effort to provide turn lanes at intersections. Remember, for the lane to stay straight you need to have a median or turn lane for the entire road segment. Bulb outs are actually, and I say this respectfully, a great design - for pedestrians. They reduce the distance pedestrians have to cross, allow pedestrians to stand in a more visible location, and provide a physical buffer from the road. Keep in mind that "awkward" conditions for drivers pale in comparison to "dangerous" conditions for pedestrians or cyclists. You correct that the point of comprehensive street design is to make drivers less comfortable, but that is how you slow down traffic. Comfort = speed, so designs like wide lanes, one-way corridors, and straight lanes are good for cars but bad for everything else. Also, when turn lanes are provided most road diets do NOT reduce capacity by a significant margin. My personal take is that if you live intown and work/go to school intown, and you care about transit issues, then you should commute via MARTA and/or bike. If you do choose to drive, you should accept that you won't be able to go fast and that there will be traffic during rush hour. In the case of North Ave, it is one block south of a six lane major thoroughfare (technically a U.S. highway) and is largely residential. I think trying to reformulate it as a street that is safe and pleasant for cyclists and pedestrians makes plenty of sense. Mike, I think what Ben is talking about is more than just "awkward." Those eastbound drivers approaching Linwood will be driving STRAIGHT AT ON COMING TRAFFIC!! A completely horrible and DANGEROUS design flaw at this intersection. As for the balance of the road, I don't have much beef with it. But, as anyone who has traveled eastbound on 14th Street approaching Peachtree and westbound on 17th approaching West Peachtree will tell you, drivers REALLY don't do well with mid-intersection lane changes. They just don't pay attention to the markings on the ground and end up driving wherever the hell they want. That is not safe for drivers or pedestrians. Just sayin', never underestimate the incompetancy of John and Jane Q. Driver. Atlanta Gal - I'm sorry your child was hit. All I can say is that I drive the speed limit on North Avenue, and one reason I take it is because it is low-hassle relative to Ponce, I can drive the speed limit and not worry about folks in the next lane merging into mine, etc. I think it is unrealistic to expect everyone who lives intown to take MARTA, bike, or walk. I've taken my share of buses, including the #16 Noble to GSU. I even got stranded for an hour and a half Downtown a few weekends ago when the #16 did't come. However, I have free parking a block from class, and I don't relish the idea of waiting at Five Points for twenty minutes at 10pm. It doesn't make sense for me economically or otherwise to take the bus every day, and it isn't something I think I should be expected to apologize for. I think bulb outs make sense at intersections where they bracket on-stree parking. In this sense, they have worked very will on McLendon. Random bulb outs in the middle of streets, less so. 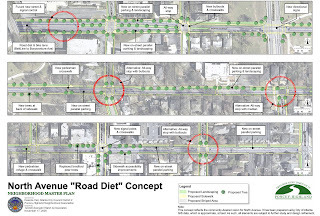 My problem with this road diet plan is that it ignores the larger problems. One problem is that Ponce is over capacity. The other is that North is a six lane road right up until the BeltLine - we "shoot up" North Avenue because that is what it is designed for! It is quicker for me to take North Ave to class than it is to take the limited access Freedom Parkway, going the speed limit the whole time. I called this a band-aid because it doesn't address the larger issues. I know it is a residential street with two lanes of traffic for maybe half a mile, but that doesn't change the fact that North Ave is a major east-west connector b/w Midtown/Downtown and Moreland Ave the rest of the way. This feels (to me) like trying to fit a square peg into a round hole. I would also encourage you, if my opinions here offend you, to read the rest of my blog and look at my body of work. I consider myself an urbanist, who wants to create pedestrian friendly environments for a living. I am 100% in favor of making North Ave, as well as the rest of the city, pedestrian friendly. I just think this particular plan isn't very comprehensive. FWIW, I'm NOT an urban planner, and in no way am I an expert. I did not intend to be overly critical. I find your writing to be generally interesting and informative and am glad you're posting. Maybe not everyone should take MARTA to work, but it is disappointing that more intowners don't use public/alternative transportation to commute. MARTA and cycling will probably never be as quick and convenient as driving (even if there were more intown rail service and better bus service), but these are viable commuting options, and they are underutilized. I wonder what percentage of commuters on surface streets like Ponce, North, Freedom Parkway, and Moreland could have a half-hour commute using the existing MARTA system. I took MARTA to the Hawks game with a friend of mine last weekend, and as we were getting off at Inman Park, I told him, "I really wish I could be getting of the train to walk home instead of getting off to go to my car." I love taking public transit, but people make decisions for many reasons, including convenience. Until public transit is convenient, it can't compete. MARTA will be convenient, and a more viable option, when Atlanta is denser. Period. My instinct about North Avenue was that it made more sense to be developed denser (say with townhomes), given its use as a e/w connector, the proximity to restaurants and bars (manuels, san fran coffee, all that stuff next to highland inn). Multifamily product exists already at north and n. highland, as well as at the schoolhouse lofts, and Cablik development has plans for townhomes at North and bonaventure at the auto repair place. That is one way you would get enough people in the area to really utilize a bus system, or something like a streetcar loop that included n. highland ave and Ponce de Leon, and tied in with the BeltLine. I don't expect Poncey-Highlands residents to get on board with that, of course, but when we talk about how Atlanta will be in 50 years does it really seem unreasonable? RE: "but when we talk about how Atlanta will be in 50 years does it really seem unreasonable?" No, it is not unreasonable and I think you've got the right idea about more compact development with townhouses and low-rise multifamily along North Ave. I think that it's unreasonable to expect that the built environment of a large city will remain static for decade after decade, particularly given the population shifts that have happened in Atlanta. Large cities are vibrant places that have to be flexible for the sake of developing ways to accommodate changes in the local economy and population. I'm not sure density alone solves the problem. Part of it is a collective change in attitude. Even with a world class transit system, it takes half an hour to travel 5 miles. Here, if you live across the street from a MARTA rail station and work in downtown/midtown (basically an optimal transit situation), it will still almost always be faster to drive to work during rush hour. Similarly, I believe the vast majority of people who live near intown rail stations (think portions of Inman Park, Candler Park, newish apts on Dekalb) still drive to their downtown/midtown workplaces. On the other hand, MARTA will become more convenient/viable as traffic becomes apocalyptic and parking becomes more expensive due to greater density. Stephen, you're right about the lane change for east-bound drivers. I hadn't noticed that it was so pronounced, but I suspect that is why they are proposing a 4-way stop. I agree that they need to be careful during final designs for the intersection to make the lane transitions clear. I just looked at this area on Google street view, and I had no idea North Avenue was so residential at this point (I'm usually on Ponce). I'm not sure about the speed limit, but it doesn't look like it should be more than 25MPH. Ben, I have to admit I'm disappointed to read this. I check in somewhat regularly here and I've agreed with just about everything you've posted, but not this. Convenience for drivers should absolutely come after safety and convenience for pedestrians, cyclists, and nearby neighbors. In every case. The close-in neighborhoods of Atlanta have been almost entirely gutted for the sake of making automobile commuting easier. Every effort to reverse that should be applauded. But what was even more disappointing than you're position on this issue is the fact that you drive everyday. Really, I didn't expect that. I think that's the primary problem with this city; even people who are otherwise forward thinking and smart are still daily car commuters. You could probably be to and from school on your bike in only a little more time than it takes to drive. But as it stands, Ben, you're part of the problem. Gee, I completely agree with Atlanta Gal on this one. Why are people "shooting down" streets in intown neighborhoods? We've finally got families with children moving back into the city in signfiicant numbers and motorists still whine about having to slow down a few miles per hour. Cry me a river. You can put all the transit you want in a city like Atlanta but the fact remains that we're still a car town and probably always will be. People around here want to drive, baby, and anything that impedes them in the least -- such as, say, a pedestrian -- is major annoyance. This post is Exhibit A.
Juliea -- I would never say that any place will always be a car town. There are examples of places that have successfully tranformed into not-car towns. In every case, it took a great deal of struggle -- the public doesn't like change, but once it happens, the change becomes the new norm. Ben indicated that even though he drives, he would choose rail if it were a more convenient option. Same goes for me. I would much prefer rail, and I hate driving, much less my having to own a car to live here. Ben, as far as I'm concerned on the post, I believe you're a little off base here. I agree that the plan for the Linwood intersection could be improved -- if it's going to be a 4-way stop, then there's probably no need for a turn lane there at all. However, the overall plan and vision expressed through this plan is a significant improvement to the dangerous conditions that exist along that corridor today. I think my biggest issue is with the Linwood intersection, although the lane swerves b/w Somerset and Bonaventure seem superfluous. I guess I disagree that the corridor is that dangerous, commenter above's experience notwithstanding. I rarely ever see pedestrians along North Avenue, and I find that 30mph feels about right for the current conditions (which is the posted speed limit). I found myself going about 35 there last night coming home after watching the UGA-GT game, and it felt a bit reckless. I don't really think speeding is a huge issue there, but of course the numbers could be wrong. I certainly regret the tone of my post. I know I disagree with most folk about "road diets". For the most part I think that wider sidewalks, narrower lanes, and medians are a good thing, but I get really sick of the speed humps and some of the bulb outs. So some of my vitriol is not directed at this particular plan. I hate to break the news, but more rail is not coming to Atlanta any time soon. It is a shame, as there should be rail lines throughout the city, serving places like Virginia Highland, Emory, and Grant Park. Perhaps this will come one day, but that day is far off. Fortunately, there is a rail system in place, which despite its imperfections provides reliable service to many of the major business areas of the city and many neighborhoods. For those who truly want to make rail transit a part of their life in this city, I would suggest seriously considering moving to a neighborhood that is well-served by MARTA rail. There are many of areas, representing a range of characters and prices. You would still likely need a car, although you might be able to get by with a Zip car. I hate driving, and driving in the city can be a pain, but when I get stuck in traffic I am thankful to live in a place where I don't have to drive everywhere. More on topic, based on personal experience North Avenue is terrifying for cyclists. It is the most direct route for me to commute, but it is incredibly dangerous. Cars on the wider western portion frequently exceed 45 mph, and cars on the narrow eastern portion zoom by without providing any clearance (fortunately the path parallels this section). Any effort to make the street safer for cyclists is a great move in my judgment. Yeah, they better four-way stop that crap at Linwood, just to be safe. As for bulb-outs and road diets, I don't mind them too much as a cyclist, hoping they slow down cars, but I love them as a pedestrian. I live on McLendon, and those tall granite curbs and wide spaces at intersections are wonderful. Hopefully the signage at Freedom Parkway will be a strong signal to drivers that the character of the road is changing. Has anyone one talking about slowing North Ave ever actually RIDDEN a bike on it? It is tremendously hilly along it's entire length. Slow down traffic as much as you want, but bike commuters going into town are going to use the parkway or midtown streets. Reason from beyond the Perimeter? !